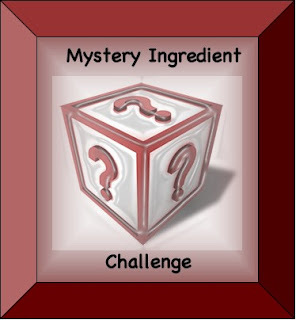 Uncovering Food: July Mystery Ingredient Challenge! First, congratulations to Danica over at Danica's Daily. She was the only person not afraid to attempt a dish that included Strawberries, Filet Mignon and Egg Noodles! Check out her Filet Mignon with a Strawberry Marsala Mushroom Sauce over Chive Buttered Egg Noodles. Let's see if more people are willing to take on the July challenge. For first time challengers, the idea was sparked by my favorite Food Network show, Chopped, where four chefs are given baskets of mystery ingredients and must make a dish that utilizes all of the ingredients. The first month I was challenged by my boyfriend and the challege was created. The winner each month will be randomly chosen from all of the eligible entries. This month's winner will receive a box of gourmet desserts. In order to be eligible, post your recipe to your blog along with a picture of the dish you made and the challenge logo. Then post a link back to your blog on this post by July 31 at 11:59PST. Your mission is to make one dish that incorporates all three ingredients in it. You can use additional products in your creation. Don't forget to review how it turned out for your readers! wow! Danicas entry was great! congrats! sorry I didn't get one in this time... things were too busy at work. Plus filet was just too darn expensive! This month though, I'm in for sure. Marsala mushroom sauce with strawberries? Wow, that's quite creative! Can't wait to see who wins the red, white & blue challenge. I WISH I liked blue cheese enough to try the red, white and blue challenge. I am not a fan of stinky cheeses. Good luck all! This is a great idea. I tried something similar on my blog with no takers (chickens). I hope I'm not the only one this month!! I just posted my recipe on my blog Cooking from Scratch. I decided to make a cracker with the ingredients: Gorgonzola & Sun Dried Tomatoe Crackers. I failed to notice that the deadline was yesterday. I thought it was today.